However, this easy Banana Cake is not called ‘MAGIC’ for nothing! When you mix together eggs, sugar, flour, butter, milk and mashed banana, pour the batter in the baking dish and place in the oven, the real magic starts! While baking in the oven this mixture will separate and form three layers. Yes, you understand well. You will make one batter and get a quick, easy and delicious 3-layer cake. 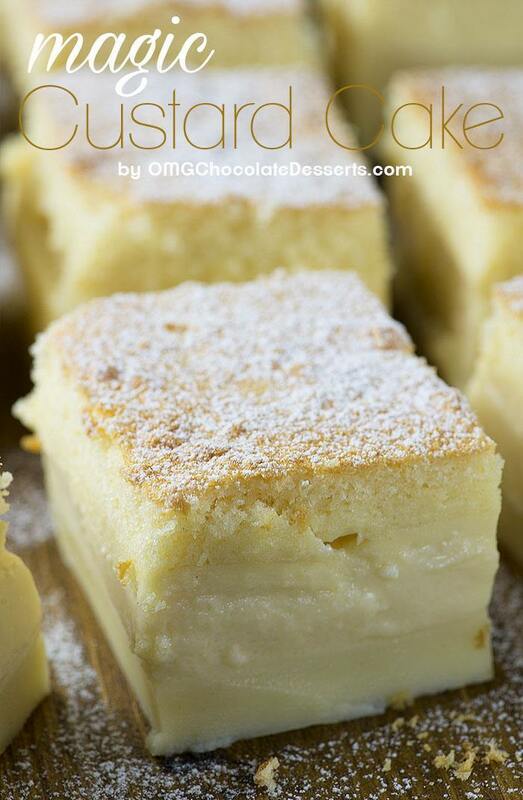 I’ve already shared other magic custard cake recipes here on my blog. This time I wanted to try a new flavor for my magic cake. After my Skinny Banana Chocolate Chip Muffins and Banana Upside Down Cake I’m a little obsessed with quick and easy banana recipes. Also I shared too many healthy and easy breakfast and dinner recipes, lately. 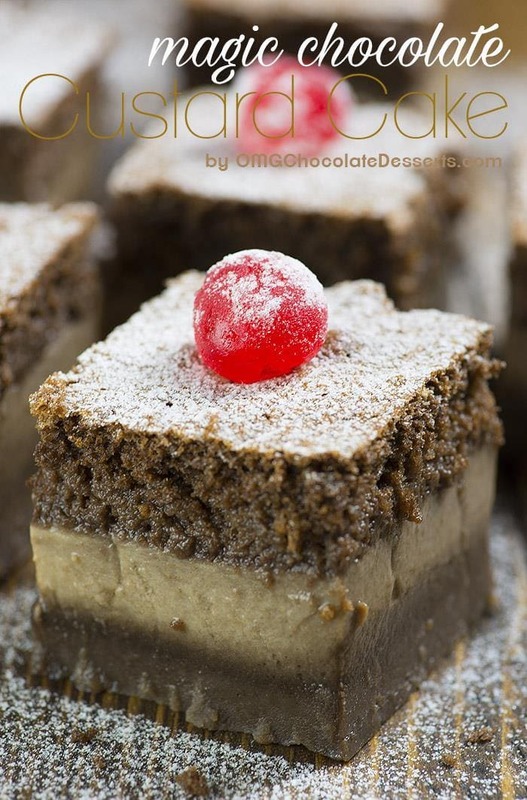 Therefore it was time for delicious DESSERT RECIPE! Let’s get back to this Easy Banana Magic Cake. With my last magic cake recipes, I noticed that many of you have had some concerns about the preparation. Therefore I’ll make a few notes this time, just to make things clear. Let’s start with the eggs. You should separate egg whites carefully, making sure that no part of the yolk fall into the egg whites. Then beat the egg whites until VERY STIFF peaks form. They should be fluffy like a cloud. Egg whites will raise on the surface of the batter when you pour it in the pan and form top layer. Many of you asked, since the batter is thin, is that correct?! Yes, it is. The batter for magic cake is REALLY THIN! The recipe uses melted butter and a lot of milk and very little flour. That way you will get center, custard like layer. 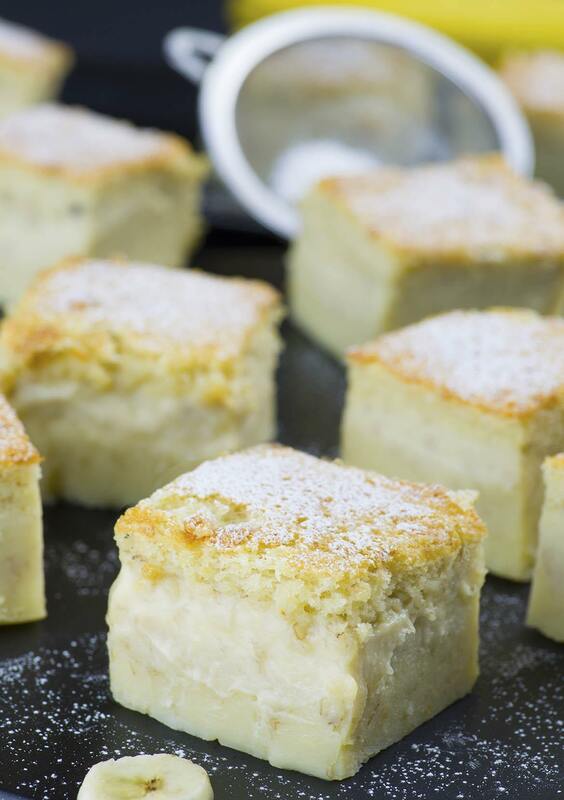 It also allows the egg whites mixture to raise on top of the batter and make the sponge. Very important thing also is to be careful when folding beaten egg whites into the rest of the mixture. You should do this really gently using a rubber spatula. You don’t want to completely dissolve the egg white foam. It should combine with the rest of the mixture, but it’s OK to have a pea size lumps of the foam, evenly distributed throughout the mixture. Also I got a lot of questions, about the filling. Looking at the photo of this cake people assume that the cake has filling and there’s no filling mentioned in the recipe. Well, that’s the magic of this cake. There’s no filling or crusts that should make separately. This ONE MIXTURE will provide both, crust and the filling. Still don’t believe in magic?! 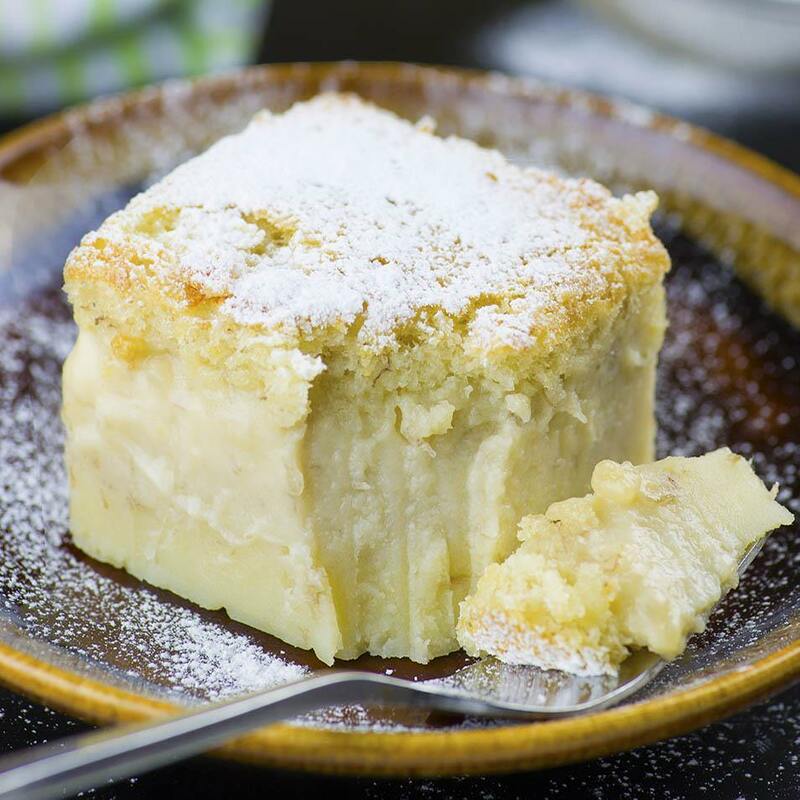 Vanilla Magic Custard Cake is melt-in-your-mouth soft and creamy dessert. It’s like hocus pocus!!! Chocolate Magic Custard Cake is the perfect dessert for a true chocoholic! Author: If you are looking for a QUICK and EASY CAKE RECIPE with just few simple ingredients, this easy Banana Magic Cake is perfect sweet treat. I’m looking forward to making this Magic cake. I made the banana magic cake and no layers formed. Please help me remedy this for the next time I make this recipe. can I use splenda instead of sugar? Sorry Michelle, haven’t tried it with splenda. If you don’t have unsalted butter on hand, wll regular butter work? Hi Sherry, it will work. Awesome! Thanks! Can’t wait to try it! I only have salted butter….would that as well? Hi Vera. Im curious if using more ripened banana(s) would work with this recipe? I know, the more ripe, the more flavorful recipes come out, such as banana bread. Also, I have the correct size baking dish, only, it’s a pyrex baking dish about 1/2-2/3 of an inch thick. Curious if you think it will make a difference of outcome after baking? Hi Vera, I commented asking about whether ripened banana(s) and a 3/4″ pyrex dish would work for this recipe? No idea if it got to you, so i figured I’d reach out to you again. Hi Kaitlynne,sorry for kept you waiting. I think ripe banana and pyrex dish will work for this recipe. What kind of milk and flour is best used in this recipe? Thank you! Hi Laarni, I used all-purpose flour and whole milk. Can you double recipe & put in a 9×13 pan? Hi Judy, I’m sorry I haven’t tried, but some readers left the comment at my Vanilla Magic Cake post that it worked fine for them in 9 x 13 pan. Hi Adriana, you could try 9 inch round pan if you have it. Just put a gluten free one in the oven. If it turns out I’ll let you know what I used. Looks yummy got to make this for my grandsons after school treat. Does this cake turn out if it’s double and put in a 9X13 inch cake pan? I made this tonight and it was so good! Thanks for sharing! Would you be able to use strawberries instead of bananas if you drain them after mashing? Can you double this and put it in a 9×13? Hi Shanon, sorry I haven’t tried so I can’t tell will it be baked well. You make no mention of the tbsp of water in the ingredients and what about the brown sugar. Where does it go? Hi Karen, brown sugar goes in egg yolks. OMG…..The bomb…….One of the best recipes I have ever made…So delicious and truly magic. Canu make it the day before? Hi Debi, use plain flour. Sounds very interesting, anyone tried it? Does it really works? I have made the vanilla magic custard cake several times. Looking to try the banana one this evening. My household has really like the vanilla version. I like to eat it slightly warm. The first time I made it I did not melt the butter and the cake portion was kind of thin but once I got that part correct it has come out well since. It smells wonderful cooking by the way. Plain flour or self raising? Hi Vivian, use plain flour. Hi, I made this cake today and only had two layers? The top sponge and a thick custard layer, what am I doing wrong? Thanks! Hi Alice, you probably bake it longer that it should or didn’t measure the flour correctly. Wondered if you could substitute soy milk or maybe coconut milk for the milk part and get close to the same results. My daughter is allergic to milk. Sorry, I haven’t tried the substitute. Dbazz, soy milk or coconut milk will substitute just fine. Do I need to refrigerate this once it is made or can I just leave it on the counter? Hi! It’s delicious! Should I store it in the fridge? Hi Carrie, store it in the fridge. Needs more bananas. Could hardly taste the flavor. Seemed like custard. I hope this recipe works, because even with adblock your page is nearly impossible to navigate, and you can’t print recipes without wasting ink on printing ads. I understand ads are how you get paid, but you should still keep it to a user-friendly level. I would suggest moving the ingredient list and instructions before the video. Maybe you could say scroll to bottom for ingredient list and instructions. Very hard to navigate page. Hope the recipe works out. How will I know if the cake is ready after 45 minutes? I made this magic banana cake this evening for family dinner. I served it chilled and got wonderful compliments! It’s not too sweet and I love the layered effect it has! Very delicious! It was okay, but you need to eat it right away… not good refrigerated. Hi!! Can you bake them individually???? Like say in individual cup molds??? Or mini cake tins with a removable bottom???? Hi Catherine, I’m sorry I haven’t tried that. Kat you still doing sweets? How have you been? Still got those crazy blue eyes? Thanks for this recipe! Never beat egg whites before in my life, but I needed an emergency dessert for company. I appreciate all the extra notes on the eggs. It turned out great! This was far from quick or easy. Hi. Just curious if you or one of your followers has tried this recipe with non-dairy milk? If yes was it successful and what milk did you try? I’ve just put one in the oven and am extremely excited as to the outcome(Yes sad, I know). Will post when it’s done. Confused on “beat” and “mix”. Beat to me equals mixer. Mix to me equals by hand. Is that what you mean when using those two words in your recipe? Thank you. Hi Trisha, use mixer for both. Is there any way we could get some pics of what its supposed to look like after you fold in the eggwhites in? Mine wasnt “smooth” by any means. I will post a pic after its done. Cant wait to try it, it looks so good!! Mine wasn’t smooth either. Please post a pic! I JUST MADE THIS! It’s cooling now waiting for us to finish dinner before cutting into it. I used the parchment paper to line the baking dish. I’m so excited to try it. I’ll post an update as soon as we’re done. Thanks for the recipe! Hi Beverly, it’s all-purpose flour. Can self rising flour be used or is there something need to add if I use self rising flour? Thank you so much for this recipe. It is delicious. I love the “magic” that happens when it cooks. I honestly thought it was going to come out a total mess. It came out of the oven looking beautiful, and it tasted great. Question: Could you substitute the banana with (canned) pumpkin? Thanks Anna. I don’t know about the pumpkin, but it might work. I just finished eating first piece. It’s not that great in taste. Very egg-y, no scent of banana and I have no custard layer. It was easy to make and I tried it out of curiosity, but I won’t make it again. Hi Gaba, thanks for the review. Hi Vera ! I tried it with the pumpkin. I used a half cup of pure pumpkin (Libby’s in the can), some pumpkin spice, instead of the banana. It turned out great !!! Can this be adapted into cupcakes???? Hi J, sorry, I’ve never tried it as a cupcake. This is a fantastic cake! Do you think canned pumpkin could substitute for the banana? Thank you for the recipe. It’s wonderful! Hi Anna, I haven’t tried. It might work. Please let me know if you try! Happy baking ! Hi Vera! I made this with pumpkin substituted for the banana. 1/2 cup pumpkin (Libby’s) with some pumpkin spice added. It turned out wonderfully !! Not quite the success I had hoped for. Easy enough to make and the whites rose to the top, but the bottom two layers sort of melded together and the family thought it was more like a bread pudding, which is not a family favorite. They all agreed it was tastey, just didn’t like the mouth feel. Different strokes for different folks! So, if your eaters like a very moist cake, you won’t be disappointed? My cake didn’t come out with a custard center. Any ideas? Hi Andromeda, maybe you baked it too long. I just made this for the first time, I did need to cover with foil as the top darkened slightly quicker the center solidified. Came out beautifully, tasted delish. Husband and kids loved this too! Thank you! Mine was a total fail 🙁 I don’t know what I did wrong but it was a mess . Hi Laura, I’m really sorry to hear that. Thanks Indy. Don’t worry about the egg whites, they float on the surface and form the top layer. I think I left it in a little bit too long, as the two bottom layers were barely distinguishable, but everything else turned out great. Hubby says this one is a keeper. Thank you! The actual ingredient list seems to not list the water and milk ??? I’ve tried this once so far and my family loved it! I’m curious to know if it can be doubled and baked in a 9×13 pan? I’m not sure would it be baked well. I just made this. Doubled it and put it in a 9×13. So good, and a nice and light choice for dessert! Will definitely make it again. How long will this keep in the frig? Thanks. Hi Clara, it will keep for a few days. Hi i made this 3 times and it always has 2 layers instead 3. Does it mean it’s overbaked? I have a hard time telling it’s done baking or not. Hi Lenie, yes it’s probably overbaked. I’m wondering what would happen if I made this with 2 or 3 bananas instead of 1. I know banana flavor will be more pronounced and that the batter will be wetter. Would I need to add more flour or do you think it would be fine? Thanks! I was so excited to make this cake and now that it is in the oven I just realized I forgot the milk!! How did I do that! Hi Mimi, heat the milk until it’s just sligthly warm. I made it but it, had three layers but the middle was still watery when I cut it. What did I do wrong? In your vanilla recipe, you use powdered sugar. Since this has cornstarch and is finer, won’t that help with stiffening the mixture before folding in the egg whites? Any reason for using regular sugar in this one? It seemed like this mixture is so runny that it dissolves the egg whites almost instantly. It would seem since these recipes use no other leavening agents, that the air incorporated is critical to giving the cake some fluff. This cake was delicious! Had a great flavor but an even better texture! Baked mine for 49 minutes and it came out great! 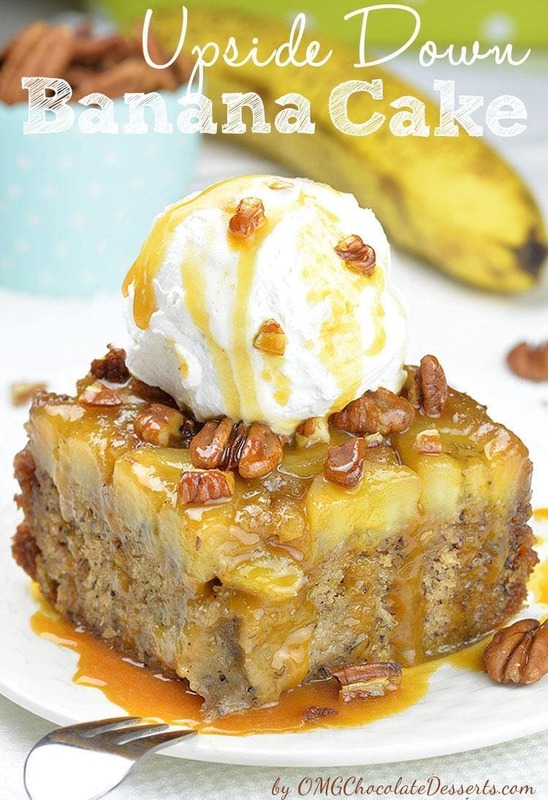 Thanks for another recipe that uses old bananas! Delicious! Great to have another recipe for leftover bananas! My kids thought the magic part was cool! This was very easy to make!! I used salted butter as I didn’t have unsalted on hand! I made this at work tonight for my clients and they said it was amazing!! I must agree!! I was sceptical but it cooked up perfectly and the taste is amazing! I did add a little banana extract too!!! I forgot to put the brown sugar in with the white sugar and egg yolks! I mixed it in at the end. I probably messed up the recipe. I also used 1 1/2 ripe bananas because I thought they were on the small side. It smells great cooking but I probably messed up the layers! Can you double this for a 9×13? Hi – The eggs are still getting cooked right and not raw? I ask as the texture is a bit different from typical cakes when I made it last night. Thanks! Very yummy. Not sweet. When the powder sugar is added on top: perfect sweetness. I will make this again. This recipe came out great the only problem I had was when I looked it up it said 2 teaspoons of sugar, when I was finished baking the cake I read it again , and it said 3/4 cup of sugar. It did come out great not too sweet and looked just like the picture. 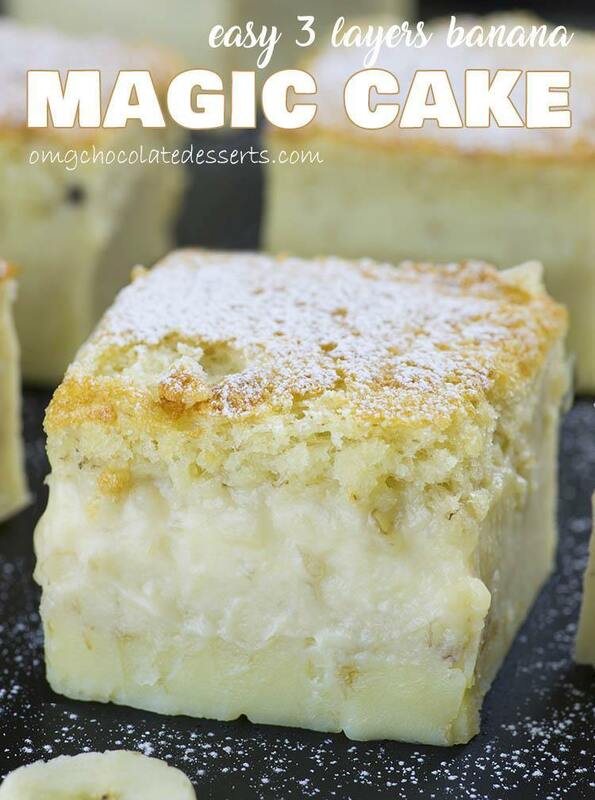 Great Magic Cake I will bake it again. I tried this and even gave half to my neighbor, we didn’t like it. Very bland, no layers no custard, possibly overcooked? I don’t think i will be trying this one again. I made this and my custard layer was very thin. I only cooked 45 minutes so I could have gone less maybe. But when I added the egg white I folded it in until it was completely incorporated because it went in lumpy. Should I have left it lumpy and not mixed totally? Hi Kathy, you don’t have to fold it completely, small lumps are OK.